Content: It’s scary, and a bit more angsty than I like my middle grade fiction to be. It, much like the others in the series, are best for the 5th grade crowd, but I’d give it to a precocious 3rd or 4th grader. It’s in the middle grade (grades 3-5) section of the bookstore. I really don’t know if there’s much more I can say about this series except this: why aren’t more people reading it? Seriously. It’s funny, it’s scary, it’s got some great storytelling. The next step for Lockwood & Co is to grow. It’s inevitable really. They’ve gotten a bit more notoriety and the cases are coming in. No longer are they utilizing their talents as a team, they’re spreading out. And their house/office is a complete pig sty. 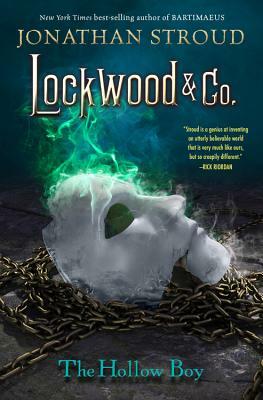 So, Lockwood and George decide that what they really need is an assistant: Someone to take calls, organize their lives, and clean up after them. So, they hire Holly. Which ticks Lucy — our main character — off to no end. And this is where the book gets angsty. Granted, Stroud never goes into full-out love triangle angst mode (yes, there is such a thing) and he lets the talking skull that Lucy carries around in her backpack do most of the snarking on Lucy’s mood but there’s no getting around it: she like-likes Lockwood, and she resents the intrusion of another girl. There’s more to the plot than that: There’s an outbreak of supernatural activity in Chelsea and lots of agents lives are being put on the line. Lockwood wants in on the action, but he’s not considered skilled enough. So the course of the book is spent getting into the action in Chelsea. Additionally, Lucy wants more free reign to use her talent of communicating directly with the spirits, something which has dire consequences. It kept me on the edge of my seat, turning pages until the very last cliffhanger (sort-of). And yes, I am sad that I have to wait another year to read the next one, but I don’t think I would put this series off. It’s just that good.